Congratulations to the following Gladiators for signing National Letter of Intents to play college athletics in the fall of 2019. 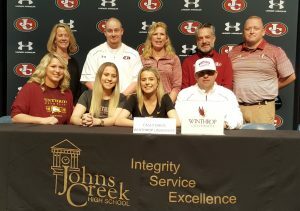 Casey Davis will be attending Winthrop University. 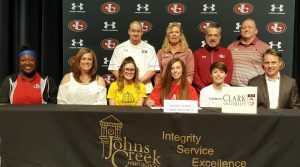 Davis has played lacrosse for eleven years, including all four years at Johns Creek High School. Some of her awards and accomplishments include: Under Armor All-American, participant in the GA All-Star game, Inside Women’s Lacrosse All-Star with a write up in Inside Women’s Lacrosse magazine, lettered all four years for varsity, set all-time school record as a freshman with 53 assists, captain her junior year, including winning the captain award, four- year honor roll student. Rachel Quinn will be attending Clark University in the fall. 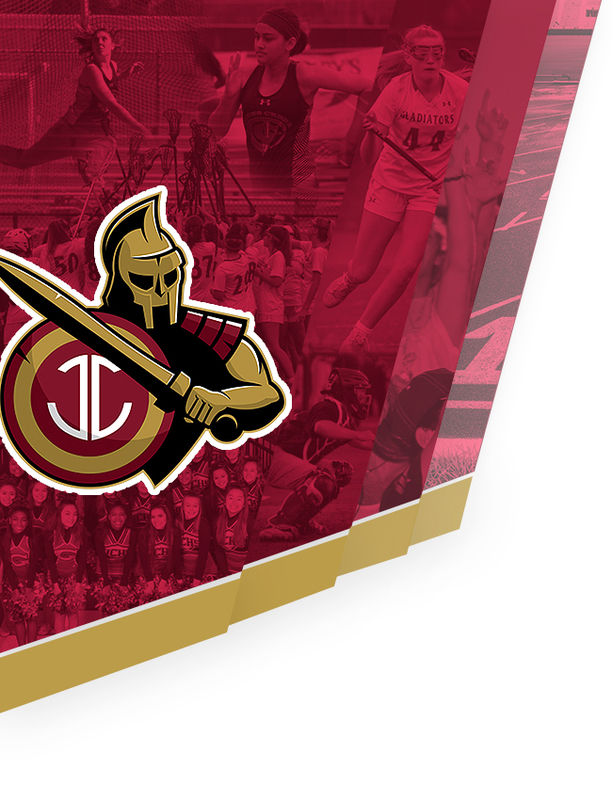 She is a nine-year veteran of the sport and has played lacrosse for all four years at Johns Creek. Quinn is a scholar-athlete, honor roll student, member of National Society of High School Scholars, and won the Defensive MVP award. 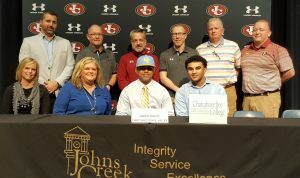 Jared White will be attending Chattahoochee Valley Community College. 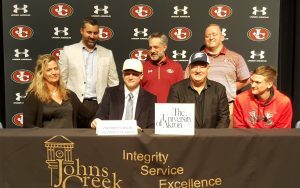 White has played baseball for fourteen years, including all four years at Johns Creek. Highlights of his career include being a three-year varsity letterman and being on the 2017 team that made it to the State final Four Playoffs. Jared has also played summer travel baseball in Michigan and Georgia with his most recent teams being the East Cobb Astros and Rawlings Southeast National. He is in the Class of 2019 High Top 500 National Rankings and is highly ranked as an outfielder and 125 overall in the state of Georgia. Neil Ilenrey will be attending Western Carolina University in the fall. Ilenrey is a dual-sport athlete, playing both football and basketball. He has been a part of Johns Creek’s football team all four years. 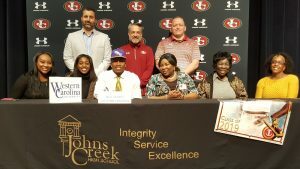 A few of his accomplishments include football first team All-Region, basketball second team All-Region, boys basketball all-time leading scorer at Johns Creek High School including the first 1000 point in JCHS boys basketball history. 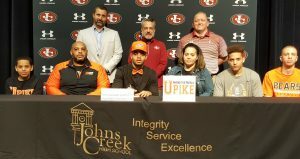 Tre’Vaughn Barnett will play football at the University of Pikeville. Barnett has played the game for twelve years including his senior year at Johns Creek High School. He was 2nd team All-Region, Player of the Week, and a member of the 900 Pound Club. Giovanni Dyer will be attending East Tennessee State University. He has played football for fourteen years, one of which was at Johns Creek High School. A list of achievements for Dyer includes being a four-year starter, team captain, Co-MVP, Region Champ senior year, 1st team All-Region, broke JCHS season record for receiving yards and touchdowns, North GA Touchdown Club Player of the Week. Zach Gibson will be attending the University of Akron. 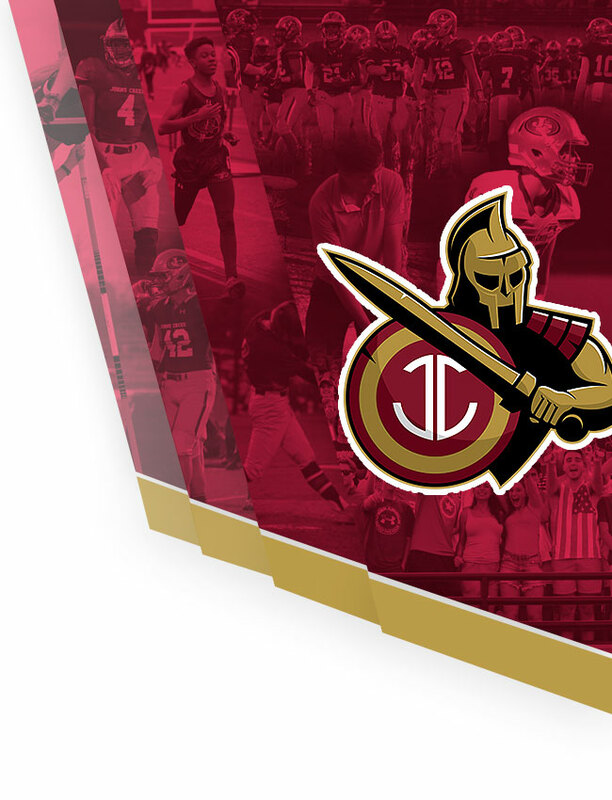 Gibson is a fourteen-year football veteran, including all four years playing at Johns Creek High School. Zach was a four-year starter, team captain, and senior MVP. He is a two-time Region Champ, 1st Team All-Region senior year, All-State Honorable Mention senior year, GA Elite Classic Junior Bowl All-Star Junior, two-time MVP camp top Q13, highest QBR rating in all classifications in the state of Georgia as a senior, holds passing yards record at JCHS, holds passing TD records at JCHS, North GA Touchdown Club Offensive Player of the Week sophomore, junior and senior years, North GA Touchdown Club Player of the Year for JCHS. 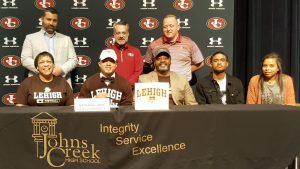 Nate Hope will be attending Lehigh University. 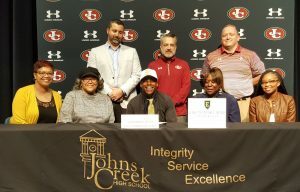 Hope has played football for eleven years and two years were as a part of the Johns Creek High School team. A list of Nate’s accomplishments includes 2017 3-time Offensive Player of the Week, 1st Team All-Region, twenty-one college offers, including 7 Ivy League, A & B Honor Roll student, 2-year team captain, 2-time Offensive Player of the Week feature on WSBTV.com, part of the 2018 Region Championship Team. 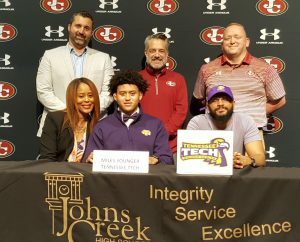 Miles Younger will be attending Tennessee Tech in the fall. Younger has played football for six years, and one year at Johns Creek. Miles was 1st team All-Region his junior and senior years, MVP Defensive Region, All-State Honorable mention defensive team, All-Metro first-team defensive end in his senior year, Team Defensive End MVP for his junior and senior year. Miles had 58 tackles and 8.5 sacks. We here at JCHS wish you all the best of luck at the next level. While your new schools have different colors, please remember that you are always a Gladiator at the core that bleeds Cardinal and Gold.